AidCurrent artist Matt Beard has been exploring the overlap of music and art creation for several years, painting live to accompany live music performance from a wide array of musicians ranging from the mellow, soulful approach of Tom Curren and Matt Costa at the Highline Festival of Surfing in 2014, to painting with local 80’s punk Minor Threat cover band Adult Crash while perched atop a 10′ vert ramp. 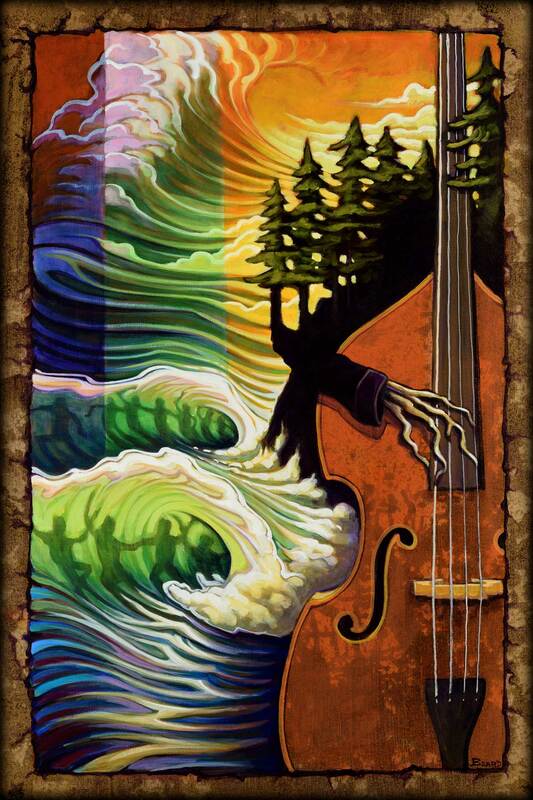 Plenty of jazz and blues have crept into the mix as well, so he was honored to be asked to create this years official event artwork for the Redwood Coast Music Festival. Rather than create the art in the studio setting, he chose to integrate things one step further and instead zeroed in musical performances from Kingfoot and Wild Iris at the Redwood Curtain Brewery in Arcata, where he set up his easel in the corner and knocked this painting out in time to the music. 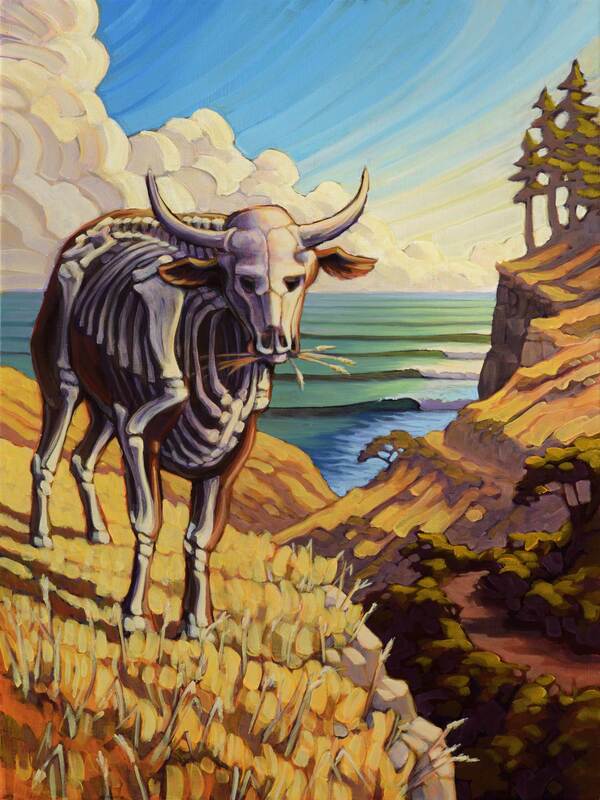 And in keeping with his usual practice of painting live he chose to donate 50% of the sale of the finished piece to the nonprofit of the buyer’s choice, which turned out to be the Redwood Coast Music Festival itself. Full circle. Art supporting music supporting art supporting music. Or something like that. Either way, we’re always stoked to see artists using their art to benefit their communities and live music festivals certainly bring communities together like few other things can. Cheers and congratulations Matt Stanton Beard! AidCurrent artist Matt Beard is no stranger to getting in his van and driving the California coast and dedicating weeks at a time to painting as much as humanly possible. He’s also no stranger to using his artwork to help support groups that are dedicated to making the world a bit of a better place. 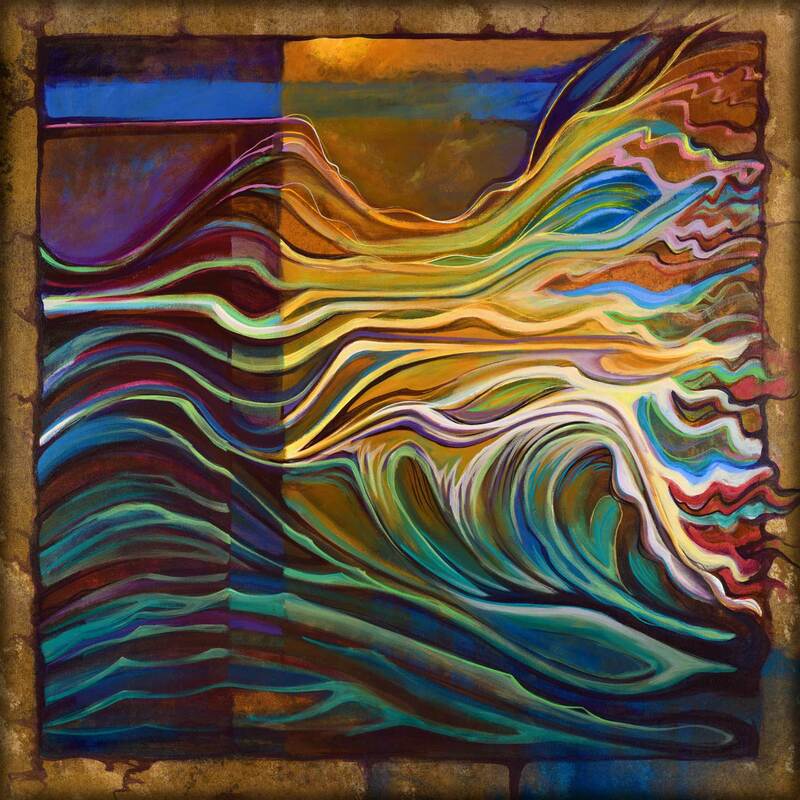 So it is quite natural that these two threads were woven together on a recent road trip where he was able to donate over $700 to Save the Waves from his proceeds of original art sales at the Redgate Ranch Music Fest and the Boardroom International Surfboard show. You’ll be stoked. And several are still available. Grab one if you keen and mention AidCurrent and Beard will donate 20% to Save the Waves. There is an incredibly rich visual tradition in music festival posters. 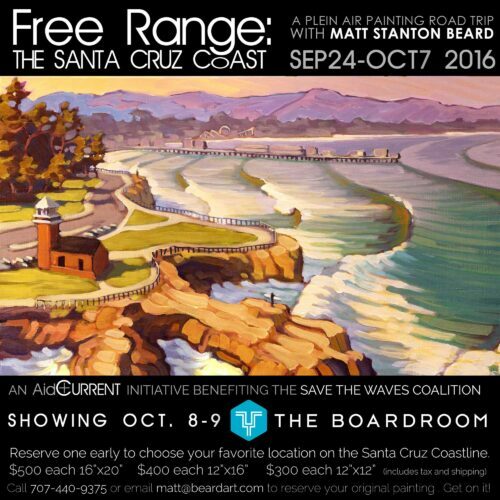 This original painting by Matt Stanton Beard was his most recent contribution to that tradition when he donated the use of the art to the Save the Waves Coalition’s annual Redgate Ranch Music Fest 2016. Speaking of operating without rules or boundaries, we’re pretty sure there’s no rule against an artist donating 20% of the sale of an original painting to anyone they should choose. In this case Beard took the liberty of donating back to the Save the Waves Coalition, a nonprofit dedicated to preserving our coastlines. 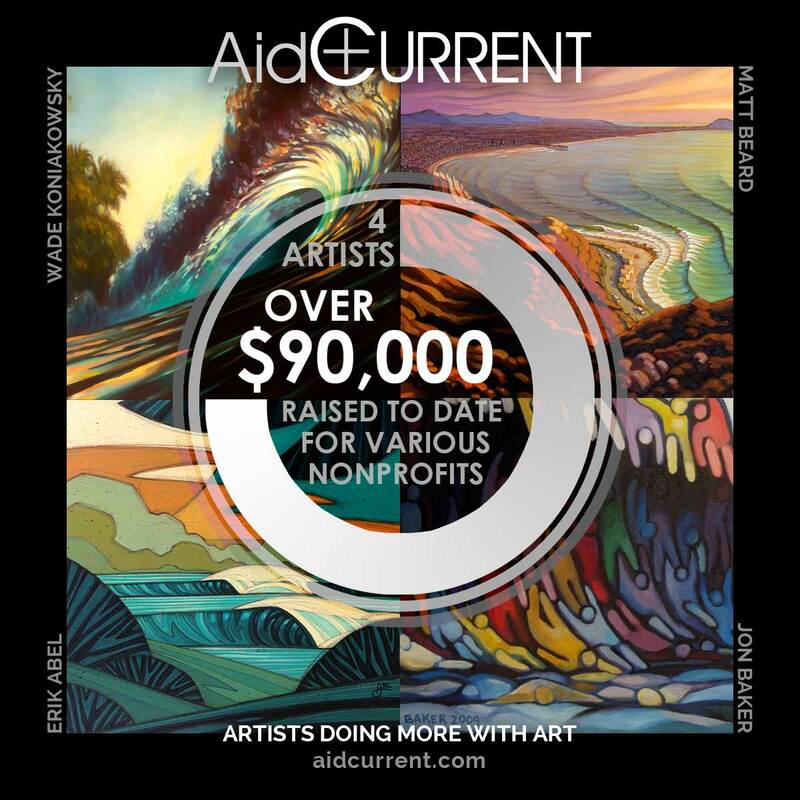 Artists are often asked to donate artwork for nonprofits’ events and fundraisers, and at AidCurrent we celebrate every success story where art can be of greater benefit to a world in need. We don’t often hear of nonprofits reaching out to develop long term mutually beneficial relationships with the artists though, so when we heard that Save the Waves Coalition had been doing just that with artists (and surfers even) ambassador program we took notice. Putting two and two together though, it’s a perfect match when you consider Save the Waves Coalition’s role in preserving the natural state of coastlines worldwide, and Matt Beard’s emphasis in his art on documenting the California coast. We’re looking forward to seeing where this collaboration goes in the future, but for now, we’d just like to congratulate Matt Beard on his fancy new title, joining the ranks of other Save the Waves ambassadors like AidCurrent artist Erik Abel, professional surfer Greg Long, and a host of others. 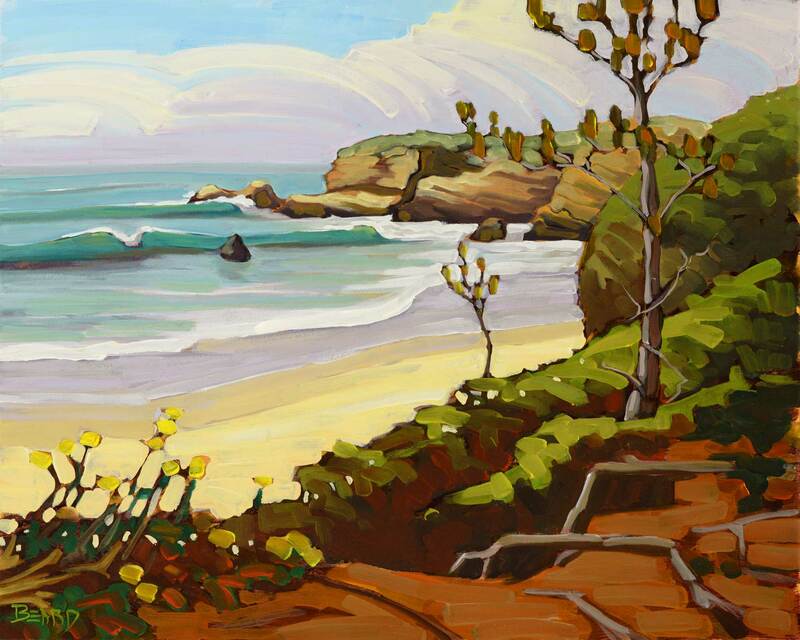 AidCurrent artist Matt Beard recently completed this piece on location somewhere on the California Coast. Painting outdoors, in “plein air”, has been Beard’s preferred way of working these days. “Why be in the studio, when I could be here” he says, pointing to the scene around him as he quickly sketches out some foliage. Birds are chirping, the breeze is blowing, and we have to agree. In fact, the more we think of it we just may move our AidCurrent office out in “plein air” as well. This particular painting of his was done after a 3 week road trip all over San Diego, where he painted nearly every day, with every single painting being a commissioned request from area collectors. But this one was different, instead of going straight to a collector he left it with his friends at Save the Waves Coalition for them to auction at their annual fundraiser in San Francisco, where it was nabbed for a deal, but still raised $350 for the group’s ongoing conservation efforts. There is something fitting in working out in this pristine environment and using that work to help preserve pristine places like this all over the world. Full circle. AidCurrent artist Matt Beard was recently asked to donate artwork to an auction fundraiser to benefit Orange County pastor Sumo Sato, who is battling cancer. 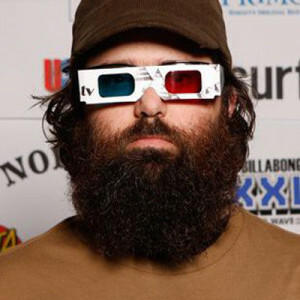 Beard had never met this pastor, but grew up surfing the crumbly beachbreak out front from Don the Beachcomber's in Sunset Beach, CA where the auction event was to be held on April 9th, 2016, and he felt moved to participate. 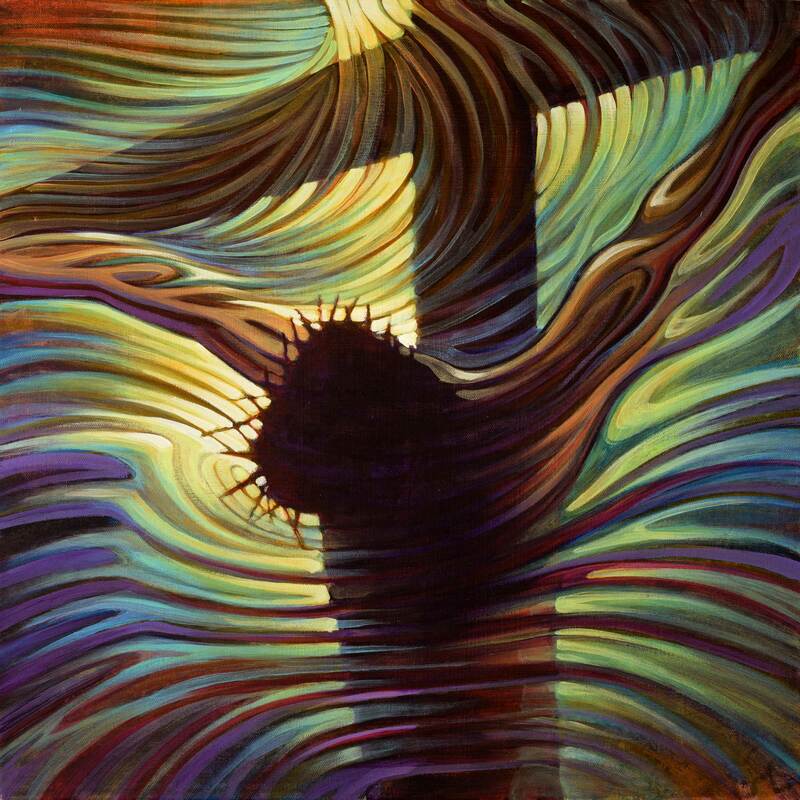 The request was for a piece of work containing a cross or crucifix. It's not everyday someone requests this subject so Beard was intrigued how it might turn out. "Body of Water" is his original work interpreting that pivotal moment in history. In proper AidCurrent fashion he didn't just donate the work and wait to see what it brought in at the auction, he actively sought bidders through his own personal social media outlets and managed to put an offer of $750 on the table before the auction even started. The offer held at auction and he was able to see the entire $750 donated to Sumo Sato to help in his time of need. Good work, Beard. 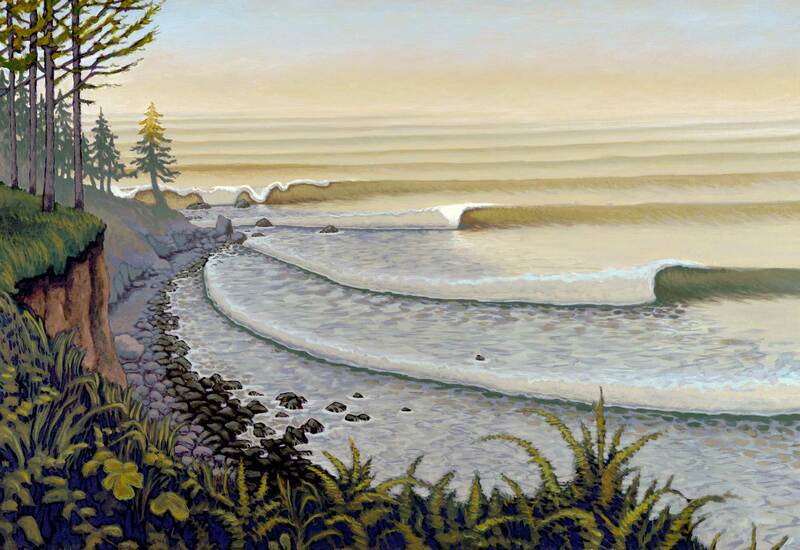 AidCurrent artist Matt Beard offered 18" x 24" posters of his painting "First Light" (shown here) along with 5 others for free with a $20 donation to Humboldt Surfrider at a Holiday event. The Surfrider folks had $300 in the jar by the end of the night and everyone was stoked. Apparently it's a thing now. Show up at his shop in Arcata, CA and make a donation on your mobile phone to the nonprofit of your choice, and he'll send you out with one of these beauties for absolutely nothing but a high-five. If you live in the area or are just passing through, don't miss the chance to get in on this! 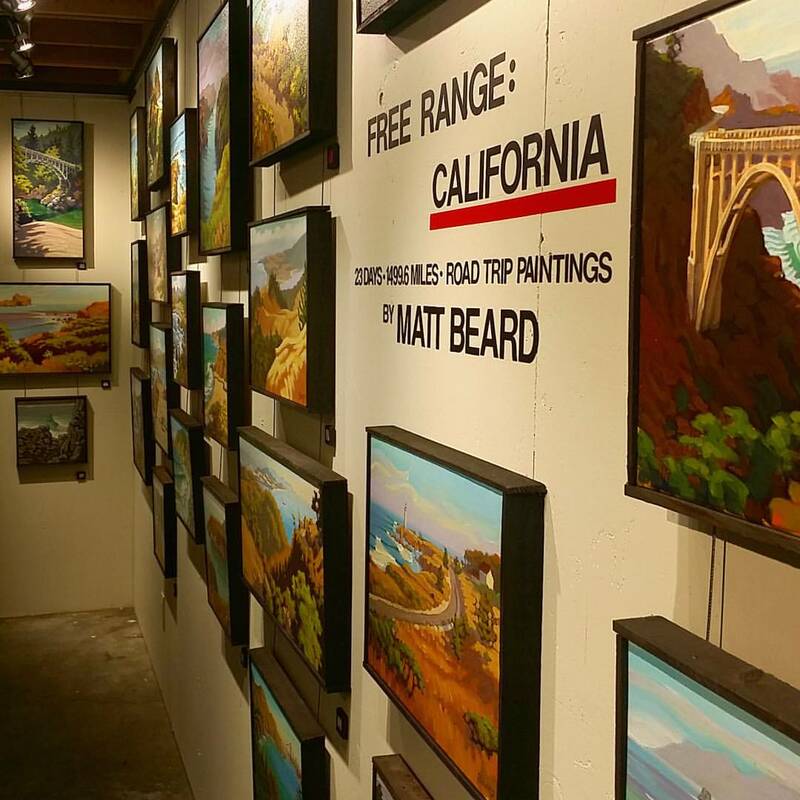 AidCurrent artist Matt Beard recently embarked on a three week long road trip down the entire California coast stopping to paint roughly every 50 miles. The resulting 32 paintings made up the show Free Range: California and were shown in his gallery in Arcata for one week only where he offered to donate 20% of any opening night sales to the Surfrider Foundation.